All Wolfgang's activities assume you've purchased Clem Tillier's TGV Addon pack. At only $US7.95 (about $AU15), it's a worthwhile purchase to obtain 4 TGV trainsets which naturally fit in with the high speed requirements of the LGV Med. Unlike Wolfgang's version 1 TGV activities, the how-to steps and files to modify the default Acela for 300 kmh running are not included in the version 1.1 TGVPack. The activities below list the various freeware rolling stock and the sites from which to download these are given. Approaching Avignon from Nimes, we're about to accelerate to the full TGV 300 kmh speed limit. Although the author provides two different activities: one for a converted Acela and the other for the Speedworks TGV Addon trainset pack, you need to download extra rolling stock, as listed below. All the following is used in TGV2 - Return with Thalys so it's worthwhile. TGV1.apk in download TGVPack.zip (V1.1, 16-Sep-02) from the LGV Med site. The 1030 Thalys service about to depart Nimes for Marseilles. As with TGV1 - First run, there are two activities, one for a modified Acela trainset, the other for the Speedworks TGV trainset pack. Apart from the the FRET-SNCF Shimms coil wagons, the extra rolling stock used in loose consists is the same as for TGV1. TGV2.apk in download TGVPack.zip (V1.1, 16-Sep-02) from the LGV Med site. EAOS SNCF tagué wagon: Eos-tag.zip (192kb)listed at www.simtrain-fr.org with a link to the http://train.lauto-rail.com/Logiciels/TrainSim/. webTrainSim substituted another SNCF wagon via ConBuilder. Shimms 3614: s_shimms.zip (1.3Mb) from www.simtrain-fr.org. webTrainSim substituted another SNCF wagon via ConBuilder. 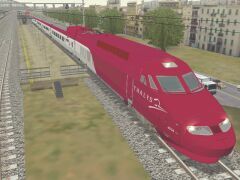 TGV3.apk in download TGVPack.zip (V1.1, 16-Sep-02) from the LGV Med site. We depart Aix-en-Provence with our rescued TGV. This is the rolling stock required, over and above what you've already got in your roundhouse for TGV1, TGV2 and TGV3. 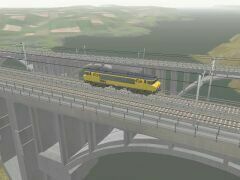 SNCF BB63500 loco: 63500.zip from Train-Sim.com. webTrainSim substituted another SNCF loco via ConBuilder because he hadn't downloaded it and was keen to run the activity! Remember to copy the modified ENGine file for the CC 72030 and WAGon file for the dummy TGV, as instructed in the "readme", from modifications.zip. TGV4.apk in download TGVPack.zip (V1.1, 16-Sep-02) from the LGV Med site. TGV5a.apk, TGV5b.apk in download TGVPack.zip (V1.1, 16-Sep-02) from the LGV Med site. With the mist clearing over the ocean, we ease our morning commuter service into L'Estaque. TGV6a.apk, TGV6b.apk in download TGVPack.zip (V1.1, 16-Sep-02) from the LGV Med site.